Members of the UNR Radio Pack at the University Of Nevada-Reno received a pleasant surprise at their last meeting when Carol McGee, a 94 year old YL who was active in amateur radio in the 1930's and 40's dropped by to pay them a visit. During the meeting. Mrs. McGee, who began her career in amateur radio as a teenager, proudly displayed her 1930's issued ARRL Membership card and a time worn picture of her depression era station, to those in attendance. Carol McGee was trained as a nurse in Chicago, Illinois and served with the United States Navy during World War II. During the UNR Radio Pack meeting she expressed her wish to be able to visit the WWII Memorial in Washington, DC. Carol has applied for a seat on an "Honor Flight" and hopes to be chosen for a seat next spring. In an ironic twist, Mrs. McGee has never actually spoken on a radio. 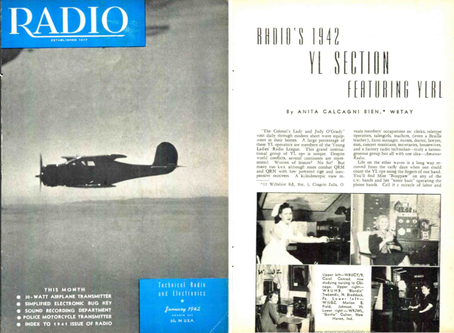 Her entire amateur radio experience was via CW. In fact, she only recently held an HT for the first time. Carol McGee was born Carol Anna Conrad in 1920. She grew up in Cleveland, Ohio. At age 19 Carol obtained her license (W8UCY) at the urging of her older brother James. She and James, W8TLQ, and friend George Williams, W8MMZ, operated a shack from the basement of the apartment building the Conrad’s lived in – mostly on 20 and 40 CW. Carol says her speed was about 20 wpm. They would have to wait until after 9 p.m. so their transmissions didn’t interfere with the neighbors’ radios – otherwise the other tenants would be banging on the walls. Carol remembers making contacts in Germany and Japan but thinks all the QSL cards were lost when the building was torn down after she left home. She recalls two older married women hams taking her under their wing and encouraging her. Unfortunately she can’t remember their names but, to this day, she says that hams are the nicest and most helpful people she has ever been associated with. After Carol graduated from high school she went into a three-year nurses training program and only got home once a month so time on the radio diminished. Carol’s nurses training was at Glenville Hospital and Lakeside University Hospital in Cleveland with a final six months in a Chicago hospital (where she was when Pearl Harbor was attacked). She joined the Navy in 1943, serving in Portsmouth, VA (where blackouts were frequent because of u-boats off the shoreline), Bainbridge, Maryland, and finally Cherry Point, NC which was a departing point for soldiers going overseas. On VJ Day the nurses were told there would be no party but they were free to go home and would have to be packed and out in two weeks. Her career in the Navy was over. On February 14, 1946, Carol married Marine “flyboy” John Bart McGee and they had three children. John remained in the service for a while and they spent time in Texas, Florida, and Maryland. After John left the service he became an American Airlines pilot and the family ultimately settled in John’s home town of Reno, Nevada. The demands of a family kept Carol from returning to amateur radio. Carol would like to reactivate her license but at age 94 (95 on January 11, 2015) she isn’t sure she is up to the challenge of retesting, especially as tests now cover so much more information. But she’s excited about being around other hams and hearing of the many changes that have taken place in the last seventy-plus years. Editors Note: Carol McGee never got to see her picture in "Radio" Magazine. Mrs. McGee explained that her family was too poor to afford a luxury such as magazines.